Horses are some of the most loyal animals. They not only serve well but also are willing to do anything for their owner or master. It is, however, very important that a horse is properly trained and he is able to trust the master. This does take some time and one must use techniques that have been used over the centuries. Lead rope technique is one of these where the horse is trained to take pressure and stay calm. This is an important lesson and success in this will go a long way in getting your horse well trained. 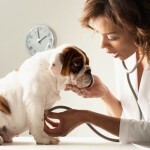 Is Your Pet’s Vision Getting Blurry? You should be standing at the shoulder of the horse at a 45 degree angle. This will protect you from a kick from a back leg as well as the side kick from the front. Safety is very important and maintain your focus on it first and foremost. This is also important to get right. Place it a foot and a half above the snap and maintain your hand at the level of the eyes of the horse. This will help you in maintaining control particularly if the horse is getting anxious. Do this by using approach and retreat method. Throw two feet of the lead rope on the back of the horse and drag it towards the ground immediately. If the horse is really frightened, you may want to start with a foot of rope. When the horse is relaxed, he will show certain signs such as licking his lips, lowering his head and neck, blinking his eyes and so forth. Rub his back and withers from the same hand that was throwing the rope to show him a sign of retreat. The horse is telling you he is no longer fearful if he shows none of the signs but remains firmly standing for fifteen seconds or more. Once the horse is getting comfortable, increase the intensity of the work. This will further train the horse. Also, start moving to the hind parts of the horse. You will also move the legs with the help of the rope. This is a great way for a young horse to get used to it. Throw the entire lead rope. It will slowly show the horse that it is not dangerous for him. This will reduce the reactions that the horse has under these circumstances. Save an Animal’s Life for FREE, Anonimously, & for Less Than 2 Minutes of Your Time!